We want to be inclusive and not exclusive, says the coordinator of Access Quality Education Programme [AQEP], Mereoni Daveta. Yesterday the disabled marched from the Flea Market to Ratu Sukuna Park celebrating inclusive education. Ms Daveta said all children should be treated the same despite their disabilities. 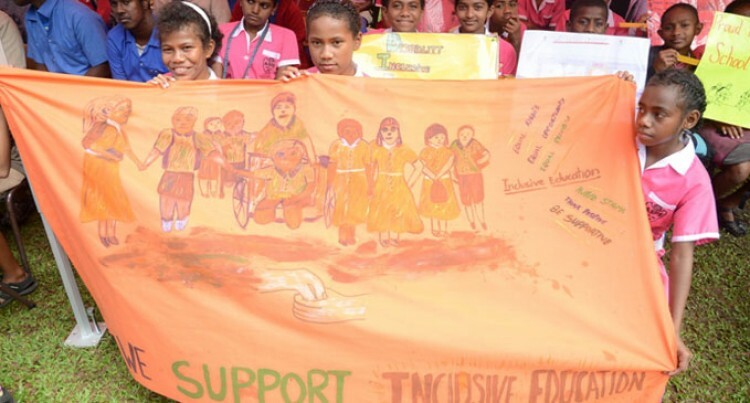 “The Disability Inclusion roadshow brings together disabled persons’ organisations and the Fiji National Council for Disabled Persons to raise awareness on disability rights and to promote inclusive education in Fiji,” Ms Daveta said. She said the main message they want to share with everybody was that all children with disabilities have the right to education. “There are 17 special schools in Fiji but they are all located in town areas so with inclusive education all children with disabilities or special needs can attend schools in their communities,” Ms Daveta said.